DaVinci Gourmet Concentrated flavored syrup is internationally recognized as the highest quality flavoring made. Originally formulated to create the finest non-alcoholic coffee drinks, DaVinci Gorumet syrup is a worldwide favorite. No one compares to DaVinci Gourmet. With over 60 classic flavors, all made from pure cane sugar, it's no wonder why our customers tell us we're the best. 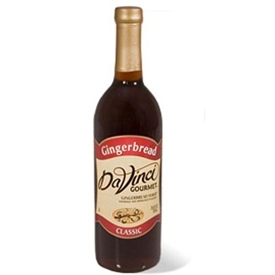 Specially formulated not to curdle milk and to hold up well under heat, DaVinci Gourmet Classic syrups are perfect for virtually any application: espresso-based drinks, brewed coffee and tea, granitas, smoothies, Italian sodas, desserts and more. Place entire amount of ready-to-go frosting in a mixing bowl. Using a hand held mixer, blend just until smooth. Then, slowing add the Gingerbread Syrup as you mix. Once the syrup is fully mixed in, return the frosting to it's storage container until ready to use. Tip: This is delicious on a sugar cookie or a cupcake!